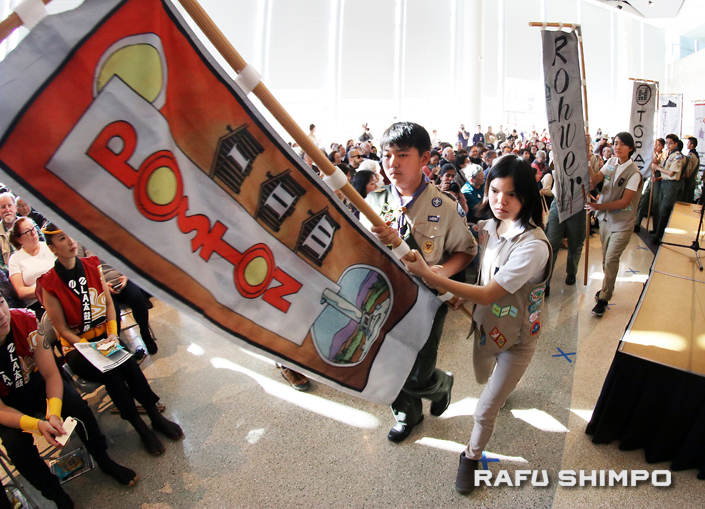 Above and below: Boy Scouts and Girl Scouts carried banners representing the War Relocation Authority and Justice Department camps where Japanese Americans were detained during World War II. 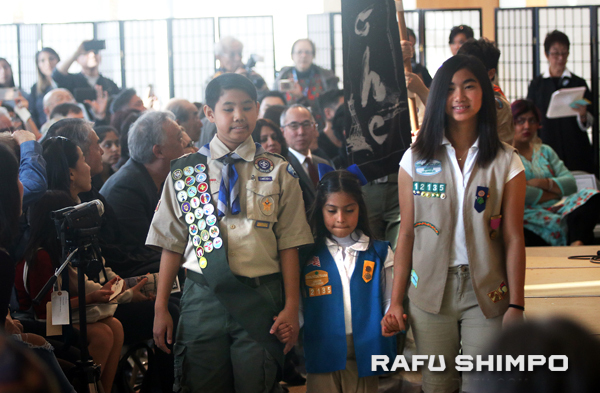 Parallels between the incarceration of Japanese Americans during World War II and current events were explored at the 2019 Day of Remembrance, whose theme was “Behind Barbed Wire: Keeping Children Safe and Families Together,” held Feb. 16 at the Japanese American National Museum in Little Tokyo. The program began a performance by L.A. Taiko Ichiza and actors Edward Hong and Kelvin Han Yee reading letters written by members of the Kondo family — correspondence between a Nisei son, Henry, serving with the 442nd Regimental Combat Team and his Issei father, Yasaku, in camp. Henry was killed in action in France in 1944. Hideki Fukusumi of Kizuna and Carrie Morita of Nikkei Progressives served as emcees. 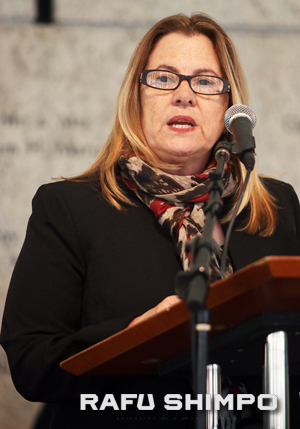 JANM President and CEO Ann Burroughs, who fought against apartheid in her native South Africa and was recently elected chair of the General Assembly of Amnesty International, said, “Our theme for this year … could not be more appropriate given the strong racist parallels between the past and the present. Two years ago we gathered here in this hall to commemorate the 75th anniversary of Executive Order 9066 under the pall of the Muslim bans. And this year we mark the 77th anniversary in the face of a national emergency, barely 24 hours old. Each is an example of executive action based on false and misleading information. “The incarceration was based on a deliberate lie, a lie that people of Japanese ancestry were a threat to national security, a lie that was fueled by bigotry and prejudice, and this is no different. Asylum seekers, migrants and refugees are no more a threat to national security than your families were in 1942. The similarities and the parallels are stark — a climate of naked racism … a false national security threat that incarcerated over 120,000 people 77 years ago, and then today the impetus for a wall that will close our southern border to people fleeing violence and persecution. President and CEO Ann Burroughs spoke on behalf of JANM. “The real crisis is the assault on the right to asylum. It’s a fundamental human right that is upheld in the laws of this country, which state very clearly that people have the right to seek asylum from violence and persecution. Instead of affording them the protection that our law and international law requires, they have been demonized and their lives and safety used as pawns in a political game. The real crisis is the separation of children and their families at the border. The real crisis is the incarceration of between 14,000 and 16,000 children in detention centers across the country. “It’s this crisis and the policy that gave rise to it that history will surely recognize as a crime against humanity. It remains to be seen whether the Supreme Court will uphold this manufactured emergency as it did the incarceration and the Muslim ban. And it remains to be seen whether it will once again ignore the underlying racism and prejudice that breathes life into these deeply abhorrent and discriminatory policies. Our job is to make sure that there is no mistaking the tragic and dire consequences of unfettered and irresponsible and unlawful executive action. JANM was also represented by Gene Kanamori, a member of the Board of Governors. 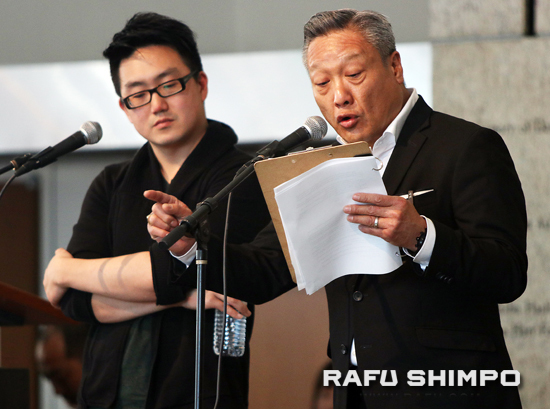 Actors Edward Hong and Kelvin Han Yee read actual correspondence between a Nisei soldier of the 442nd RCT and his Issei father in camp. A camp roll call and procession were held to remember those who were incarcerated, particularly the Issei and Nisei whose sacrifices and accomplishments were cut short. Banners representing the camps were carried by members of Nishi Hongwanji (Boy Scout Troop 738 and Girl Scout Troop 12135), Venice Japanese Community Center (Boy Scout Troop 764), and Christ the King Lutheran Church (Boy Scout Troop 242). The War Relocation Authority camps — Amache, Gila River, Heart Mountain, Jerome, Manzanar, Minidoka, Poston, Rohwer, Topaz, and Tule Lake — were represented along with Crystal City and other Department of Justice camps. 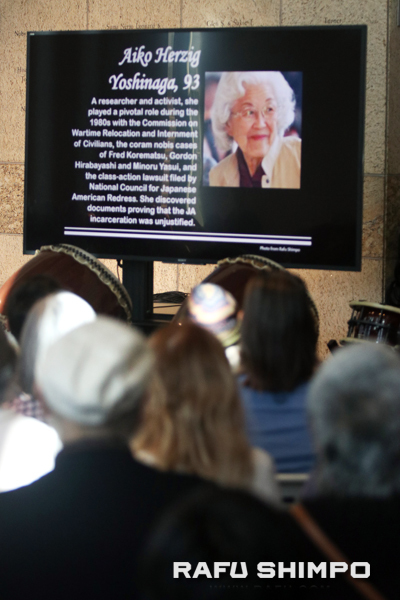 The “In Memoriam” segment included redress activists such as Aiko Herzig Yoshinaga, who was recognized at last year’s DOR. Veterans and former incarcerees were asked to stand and be recognized. Those with family ties to a particular camp, as well as those without a direct connection to the camps, also stood. “Let’s take a moment to honor all who were forcibly removed and lived in America’s concentration camps as well as those Japanese Americans who lived outside of the military zones and suffered from the racism and hatred heightened by the executive order,” said Morita. “We also pay tribute to the thousands of Japanese Latin Americans, German and Italian Americans who were incarcerated by the U.S. government. “And we pay respects to all of those who are no longer with us, family members, friends, activists, leaders who left our community and the country a tremendous legacy about the camps, about rebuilding lives and communities, about the Japanese American experience and about fighting for justice. 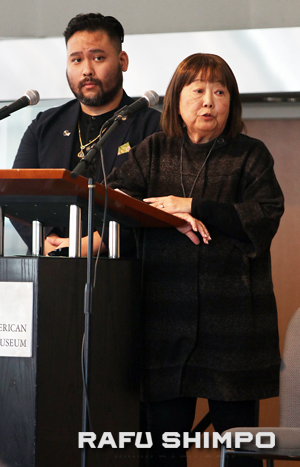 Kay Ochi and Richard Katsuda of Nikkei for Civil Rights & Redress paid tribute to notable individuals who have passed during the past year, including redress activist Aiko Herzig Yoshinaga, who attended the 2018 DOR.